On Sunday 12 July, internationally renowned artist Rabab Ghazoul presented a participatory open rehearsal of song followed by a performance with Welsh choirs at The Welfare, Ystradgynlais, which brought to life the work of Polish émigré artist Josef Herman. Ghazoul, who is currently representing Iraq at the Venice Biennale 2015, has worked with the Josef Herman Art Foundation Cymru, Tate’s online selection of Herman’s sketches, and community members and groups from Ystradgynlais and the surrounding area as part of Mining Josef Herman – a project exploring the work and legacy of Herman through archives and digital learning. Mining Josef Herman is part of the Archives and Access project led by Tate and supported by the Heritage Lottery Fund. Herman’s writing and his journals provide a striking commentary to his visual work. His observations about poverty, injustice, the lives of working people, the landscape, community and the human condition, resonate as powerfully today as they did sixty years ago. Rabab has been working with local groups to open up the visual world of Herman’s work through his writings. 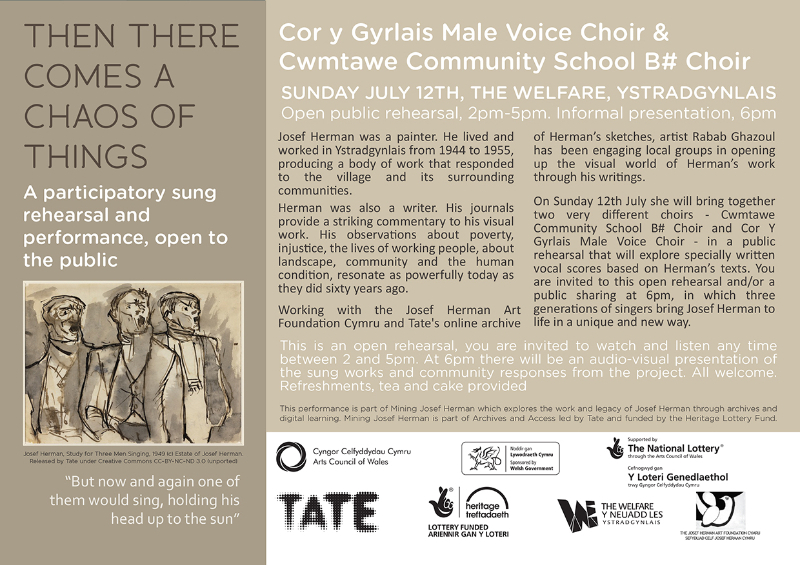 The project culminated in THEN THERE COMES A CHAOS OF THINGS – a participatory open rehearsal of song between 2-5pm and performance at 6pm on Sunday 12th July at The Welfare, Ystradgynlais, with local choirs Cor y Gyrlais Male Voice Choir & Cwmtawe Community School B# Choir. The performance explored specially written vocal scores based on Herman’s texts, with three generations of singers working together to bring Josef Herman’s work to life in a unique and new way.